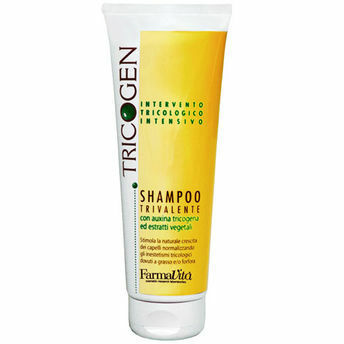 Enriched with Auxina Tricogena and Balsamo Fioravanti, this Tricogen Shampoo represents the foaming agent version of the lotion with a detergent action. This ensures a long lasting effect of the active ingredients on hair. This concentrate is composed of Auxina Tricogena and Balsamo Fioravanti. The first ingredient is able to improve metabolic exchanges between hair and blood circulation; at the same time the many extracts contained in Balsamo Fioravanti ensure a sustained action against excessive sebum and dandruff. Explore the entire range of Shampoo available on Nykaa. Shop more FarmaVita products here.You can browse through the complete world of FarmaVita Shampoo .